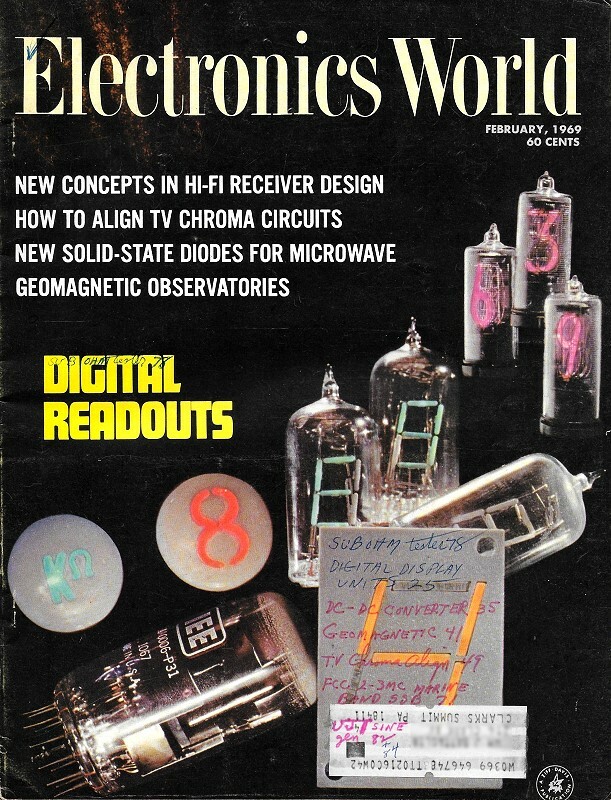 Reading through the news items in the vintage electronics magazines provides a mixture of important historical facts and figures along with some predictions on the future of the industry. Some of the predictions turn out to be amazingly accurate, even though in retrospect they might seem obvious. Take, for example, Sylvania VP Dr. Robert Castor's foresight about how, "the future growth of the semiconductor industry lies in a major switch from the production of individual components to solid-state subsystems that can be used as building blocks in electronic designs." "Well of course," you might be temped to say; however, at the time there were still significant hurdles to overcome related to material purity, wafer size, photolithography, packaging, reliability, etc. There was also the ever-present resistance to change by designers comfortable with circuit boards packed with discrete transistors, resistors, and capacitors. Inertial navigation systems were making their debut on commercial airliners at the time. Battery technology improvements were in full swing in the 1960 and 1970s as transistorized products enabled a new level of portability; Li-Po cells weren't even on the drawing board - literally (pencil and paper, no CAD) - at the time. If you think self-driving cars and automated highways are the brainspawn of Elon Musk and Jeff Bezos, take a look herein. The entire semiconductor industry is changing its face. According to Dr. Robert C. Castor, Vice-President and General Manager of Sylvania's Semiconductor Division, "the future growth of the semiconductor industry lies in a major switch from the production of individual components to solid-state subsystems that can be used as building blocks in electronic designs." Dr. Castor, who is one of the most respected industry analysts, estimated the subsystem market could be as much as 50% of total industry sales by 1973, and at that time sales should reach a record $1.65 billion level. whipping around the moon and earth are guided by a super inertial navigation system manufactured by the AC Electronics Division of General Motors. Working with a special digital computer developed by Raytheon, the system uses gyros and accelerometers to measure changes in the spacecraft's attitude and speed and uses the data to steer the ship to and from the moon. A sophisticated precision sextant and scanning telescope, produced by Kollsman Instrument Corp., updates the inertial system in flight. Less sophisticated, but perhaps more important to everyday, earthbound travelers, is the Carosel IV, which AC claims is the first inertial navigation system built as an integral part of a commercial aircraft's avionic subsystem. According to AC, the Carosel IV will provide the 490-passenger Boeing Jumbo Jet 747, with high-precision, fully automatic all-weather navigation between any number of points on earth. An earlier navigation system, the SGN-10 built by Sperry Gyroscope Co., scheduled for installation aboard Pan American 707 aircraft, was scrapped when Sperry couldn't meet production schedules and Pan Am claimed the system was too unreliable as well as too inaccurate. AC says its system falls within the maximum FAA error limits 95% of the time - an acceptable standard. Meanwhile, all the buzzing about the AC system is stirring up the old pilot-airline-FAA over ocean air-corridor controversy. The FAA and airlines would like to cut the space around the plane from 120 to 90, or even 60 miles. This allows more planes in the air at one time, a help during peak hours. World Airlines Inc. was fined $5000 for not having a precise navigation system on board one of its planes which strayed over Soviet territory and was forced down with 214 soldiers aboard. Perhaps an inertial system could have helped. have been notoriously unreliable. Many units touted to be good for months, and even years, have failed after a few hours or days of operation. According to battery manufacturers, the big problem has been and, as a matter of fact still is, temperature changes or rather environmental changes. What happens is that batteries are tested in the lab to meet certain specifications (incidentally most military units are tested to the same specs as commercial devices) where they pass with flying colors. It's another matter when the battery is in the field - it fails. Japan's Matsushita Electric Industrial Co. has developed a thermal battery which it claims has a storage life of five years compared to two-to-three years for ordinary batteries. Here's what the company claims - operating temperature of -54° to +71° C compared to -10° to +60° for conventional batteries. The big news is that it is available for the commercial market. Heretofore, any batteries of this type have been earmarked strictly for military. The device has an open-circuit voltage of 38 volts. It measures 58 mm in diameter and 47 mm high, excluding terminals. is one of the last places where a man with a hot idea and a few dollars can make money quickly - or lose it. And according to the magazine "Engineer," a publication of the Engineers Joint Council, some 1200 toy manufacturers do almost $2-billion business each year. These companies employ a large number of engineers - some electronic, but mostly mechanical and industrial types - to do R&D and create new mechanisms and product designs. Perhaps it's not strange that the toy industry is also one of the most cost conscious of all industries. It is constantly looking at new technologies in a way that benefits other industries as well as the toy business. And they investigate every conceivable material and device which in any way might bring costs down. Electronics, optics, audio techniques, and even fluidics (which has not even gained public acceptance) are all utilized. Other advanced technologies still on the drawing boards of many companies - liquid crystals, for example - are being studied for playtime possibilities. Holography anyone? around the corner? Some people at the General Motors Research Laboratories think they might be and have developed ERGS II (Experimental Route Guidance System) to provide drivers with automatic, high-quality routing instructions at certain decision points along highways or city streets. The work which is being done for the Federal Highway Administration, is aimed at determining whether route guidance can increase safety and reduce trip time, routing errors, and driver stress. Essentially, ERGS II is a two-way communications and logic system where the car is a rolling transmitter that broadcasts its movements to a fixed station at certain intersections along the right-of-way. Here's what happens. When a driver leaves on a trip, he uses a five-letter code word to enter his destination on a console in the car. As the car approaches an instrumented intersection, the console automatically transmits the destination to roadside equipment where the code is processed and appropriate routing instructions are transmitted back to the car and displayed on a dashboard message panel. The entire transaction, which requires only a few milliseconds, is repeated at each instrumented intersection until the driver reaches his destination. The important thing about this new development is its potential for improving highway safety. Often serious accidents are caused by drivers missing turns and backing against traffic, etc. Hopefully, the dashboard display with its large alphanumeric symbols will provide an easily interpreted method for presenting routing information to drivers. team up in a new program by the University of California at Los Angeles and General Electric Co., which is designed to improve highway safety. Working together, the University and company have developed a technique called Computed Perspective Image Generation. Computers are linked to the accelerator, brake pedal, steering wheel, and other instruments inside a mock-up car. These provide inputs for a master computer which, in turn, controls the projection of real life events on a gigantic television screen. No cameras, films, or models are used. The entire highway environment, which includes moving cars and people, is computer-generated and displayed on a screen in front of the driver who sees the simulated roadway as though he were looking through his car's windshield. always an important, though vague, area of military operations will receive more emphasis in Army plans for the future. The removal of the distinction between strategic and tactical communications networks is being pushed and a master plan involving the Army Air Force in tactical field communications work is being pressed. The new role for communications was spotlighted at a recent classified briefing for industry held by the EIA and the Army Command. According to one manufacturer attending the conference, "The Army is the big customer for future communications equipment." This should make a lot of manufacturers happy, especially since Russell D. O'Neal, Assistant of the Army for R&D, estimates that total Army electronics procurement will reach $730-million in fiscal 1969.
about thinzs going on ... Large-scale integration throws most of the old semiconductor reliability concepts out the window. Present testing techniques are inadequate because they do not include failure rate per failure mode as a function of time, and do not allow for variations in the manufacturer's line .... Ampex plunges into the data handling market with its Videofile system. The system with its six basic units - television camera, video tape recorder, buffer, remote display terminal, electrostatic printer, and control center - has applications in business and government for storage and retrieval of graphic material which cannot be digitized economically or microfilmed .... Looking ahead to the end of big military spending, Bendix Corp. is shifting emphasis to non-government markets, according to A. P. Fontaine, the company president. Bendix expects $2-billion in non-government sales by 1971.